Tag Archive | "Nerite Snails (Neritina natalensis)"
Nerite Snails (Neritina natalensis) are a species of aquatic gastropod mollusks that are endemic to Kenya, Mozambique, Somalia, South Africa, and Tanzania; specifically the coastal plains of East Africa. They are prized by tropical fish keeping enthusiasts for their attractive shell designs and their efficient scavenging of uneaten foods and algae in the aquarium. In tropical fish keeping circles, Nerite Snails are often referred to as the Tiger Nerite, Zebra Nerite, Olive Nerite, Ruby Nerite, Tracked Nerite Snail, Zebra Snail, Horned Nerite, and Black Racer Nerite. Several species of Neritina natalensis go by the common name Zebra Snail and are sometimes confused with Nerite snails. 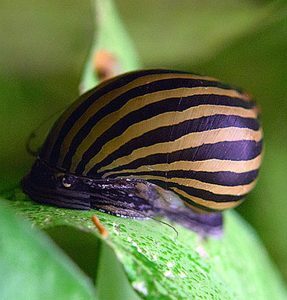 For example, Puperita pupa is a small marine nerite snail found in brackish waters of the Western Atlantic (specifically the West Indian Island of Dominica) that also goes by the common name Zebra snail. Nerite Snails are found in freshwater pools, ponds, the lower regions of larger rivers, and slow moving streams but they require a brackish or marine environment to reproduce. Nerite Snails are a peaceful, non-predatory species that because they do not reproduce in fresh water, will not overpopulate your aquarium like many of the other more common snails. They are extremely docile mollusks that go about their business of cleaning the aquarium without ever bothering their tankmates. Zebra Nerite Snails are undeniably the most popular of nerites sold in the aquarium trade. They have beautiful golden shells with black jagged edged stripes running down from the top of the shell and seldom grow to over 1″ in size. Females are generally larger than males but are otherwise indistinguishable. 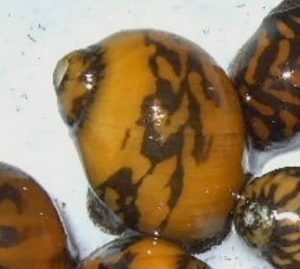 Tracked Nerite Snails, also known as Ruby Nerite Snails, are not as common as the Zebra or Olive Nerite and are often sold generically to tropical fish keeping enthusiasts as Nerite snails. Ruby Nerite snails have a reddish orange shell with small black stripes, dashes, or spots reticulating around the shell. The black markings are said to resemble tire tracks which is undoubtedly why they acquired the name Tracked Nerite snails. Ruby Nerite snails are generally larger in size than Zebra Nerite snails and can grow to over 1″ in size. Nerite Snails do best in an established, densely planted aquarium, that has been properly cycled and has settled, stable water parameters. Live aquarium plants will continuously drop leaves and discard plant matter into the water column, which prevents the aquarium from being too clean and provides an ongoing source of food for the snails. This is the perfect environment for Nerite snails which seem to be perfectly content in a “dirty” tank. Placing Nerite snails in a tank devoid of algae or uneaten food will eventually starve them. Caring for Nerite Snails is pretty straightforward. They are a hardy species that readily adapt to a range of water conditions but are sensitive to Ammonia and Nitrate spikes. They seem to prefer relatively hard, moderately moving water with a temperature between 72 and 78 degrees F. and a Ph of around 7.5. As with all snails, they cannot tolerate copper at any level in their environment. Before treating community aquarium fish for diseases with medications that may contain copper, either remove all snails and shrimp from the tank or remove the diseased fish to a hospital tank for treatment. Nerite Snails will leave the confines of an aquarium when they are not “happy” in their environment, and even in a perfectly set up tank, it is not uncommon for them to occasionally venture to the top of the tank and leave the water. Occasionally they fall off the rim onto the ground where they die from desiccation, however they can last for quite some time out of the water and will usually revive if they are not completely dried out when placed back into the tank. Nerite Snails have a difficult time turning over, so when adding them to the tank, place them on their foot. Breeding Nerite Snails has been accomplished, but only with limited success. When several specimens of the same age are kept in the same tank and fed the same foods, the females will be larger than the males. All species of Nerite Snails have a marine larval stage, so in order for successful reproduction to occur, they require brackish water. Feeding Nerite Snails is generally not necessary unless they are placed in a spotless tank. They are scavengers that are widely noted for their algae eating abilities and will sustain themselves by eating uneaten food, debris, and algae off the glass, rocks, and even off the leaves of underwater plants. Because the Tracked Nerite Snail is larger and weighs more than other Nerite snails, they may not be able to successfully eat algae off of the smaller leaves in the tank and may occasionally require an algae wafer or shrimp pellets as a supplement to their diet, but generally these snails will keep your tank spotless. 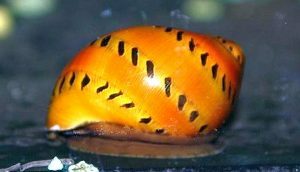 The Zebra Nerite Snail, Tiger Nerite Snail, Olive Nerite Snail, Black Racer Nerite Snail, and Horned Nerite Snail are all available to tropical fish keeping enthusiasts online and in most tropical fish shops at various sizes.